Dogs in Horse Stables: Risks? Safety is important when Dogs in Horse Stables get a little too curious. The ivermectin in worming pastes, an anti-parasite treatment for heartworm, is extremely poisonous and harmful to dogs if consumed in high quantities. 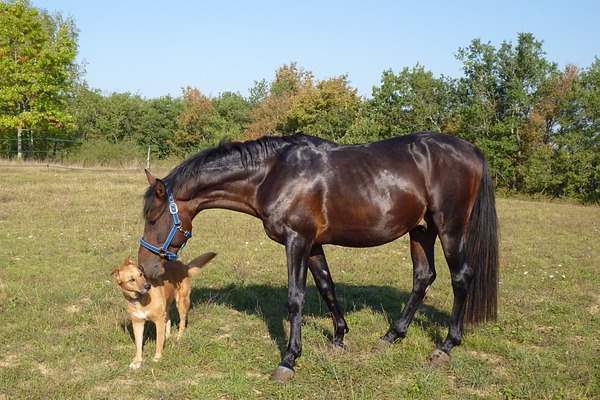 The amount used on a horse is 25 to 30 times more the dosage than that given when worming a medium to large dog. Other herding breeds and mixed breeds are also prone, along with older dogs that have previously experienced a blow to the head, and puppies. This hereditary indifference is due to the dog having the MDR1 gene, but not all individuals from the list of breeds carry it. The only way to find out is to take your dog to the vet, who will scrape cells from the inside of the dog’s cheek, sending it away for testing. Be careful that tubes of worming pastes are not left lying around where a dog could easily get hold of one and chew it. Also, be aware of any worming paste that has been dropped on the floor by the horse, allowing the dog to lick it up and ingest it. Dogs love to eat horse manure, much to the disgust of their owners! However, when horses are wormed, the quantity of ivermectin found in their manure peaks after two-and-a-half days, but can still be toxic after two weeks. These warning signs can appear in just a few hours and require urgent veterinary treatment. The vet will need to generate vomiting and give charcoal once this has stopped. The dog may need intravenous fluids and possibly a feeding tube along with a ventilator. Recovery can take several weeks, requiring the dog to have dedicated nursing and care. Dogs are always happy when the farrier arrives to shoe the horses as they cannot resist hoof trimmings. Attracted by the odour, they make a tasty treat. It is not known for sure if they provide any nutritional value for dogs, but are thought to contain protein, calcium and biotin. Most dogs can chew or eat small, fresh trimmings without any problems. However, be aware of any horses treated for conditions in their feet, such as thrush, or if hoof dressing has been applied, as the chemicals in the solutions can be extremely toxic to dogs. Also, check for any bits of nails left in the trimmings. Large or sharp pieces can irritate or perforate the stomach, oesophagus or intestines. Be sure to sweep up and throw away all trimmings, once the farrier has finished. Older, drier chunks are more likely to have bacteria or mould contamination. They are also harder to digest and can cause mycotoxin (poison from mould or fungus) to dogs. In some cases, dogs will need their stomachs pumped if they have swallowed large pieces. The dog will require an immediate assessment from the vet, as even a small amount of Bute can be deadly, and is likely to need the same treatment as for ivermectin poisoning.